The best present I received on the first day of the new year was reading (former police chief) Hanif Omar’s article ‘Let’s make a united push’ in The Sunday Star. Like any loyal Malaysian, I feel encouraged to continue to believe in Vision 2020. Three of my four grown-up children did not believe that Vision 2020 will ever come true and they chose to migrate. I have failed to convince them to stay. Every time I read about the New Economic Policy (NEP) or some injustice, I think of joining my three children. The worst test was when I saw Umno Youth head Hishamuddin Hussein with a keris, demanding the continuance of the NEP at the last Umno general assembly. The advertisement jingle ‘Malaysia, truly Asia’ is intended to project the image of a contented, plural society living in prosperity while the reality is that there is simmering resentment particularly among the minority groups. But Hanif’s article is quite reassuring and offers the encouragement I need at this trying time. He urges all Malaysians to unite and push our government, Parliament, NGOs, corporate leaders and citizens to make a united effort to achieve Vision 2020 for Malaysia to become a developed nation. Hanif has made several suggestions and emphasised that Vision 2020 is to build a strong and united nation based on justice, equity and equal opportunity. These are the basic criteria for a country to be classified a developed nation. I wish to do my part in writing this article which contains several important but sensitive issues. Our political leaders would prefer not to talk about these issues but I think it is better to face reality. As former premier Dr Mahathir Mohamad suggested recently, that it would be better to have a stronger opposition in Parliament so that issues like these can be raised and discussed openly without fear. When Mahathir was prime minister. he declared that Malaysia should become a developed nation by 2020. Current premier Abdullah Ahmad Badawi recently reaffirmed that he too is determined to achieve this goal. If we really want to become a developed nation, we must first get rid of (notions of revival of) the NEP and corruption – elements that often make many people cringe in embarrassment. The ultimate effect of the NEP will leave the Malays being less efficient and the country less competitive in this borderless world. All developed nations guarantee justice, equity or fairness and equal opportunity for all citizens. All citizens are entitled to the privileges and immunities. All discrimination must be eliminated. The NEP does not offer justice, fairness and equal opportunity for all citizens. If all Malays are united and determined to give up the NEP, we can do it. We must remember that the NEP and corruptions retard our progress – it is just like driving uphill with the brakes on. All developed nations have a much better GDP per capita and corruption rating on the Transparency International (TI) perception index on corruption. I have compared Malaysia with Asian countries that are classified as developed nations, so that we have a better idea of our position and what we need to do to achieve our goal within the next 14 years. We were an under-developed nation before Independence and now we are classified as a developing nation. Israel, South Korea, Japan, Taiwan, Hong Kong and Singapore are classified as developed nations. As the data shows, we need to at least double our GDP per capita income to match South Korea. That means the government machinery and private-sector industries and corporations will have to improve their efficiency in order to double our productivity. The most effective way of doing so will be to practise meritocracy. If we do not, we will not be able to ensure that we have the most qualified people with superior training and management skills to manage the affairs of our country. What is meritocracy? It is a system of management which is strictly based solely on ones ability (merit), not political connection, social position or race. Merit means ”intelligence plus effort”. It is quite different from aristocracy or NEP which is a system that caters to biased practices and nepotism. True meritocracy acknowledges individual prowess and rewards it in kind, regardless of disposition. It is one of the most important principles in human civilisation. It is most important to practise meritocracy in student admission to our institutions of higher learning. If we accept lower-grade students, we will only get lower-grade graduates. When we have lower-grade graduates to manage the government and private sector services, we can only expect lower-grade results. I was shocked to read in the newspapers that, during the last university entrance selection, one of Malaysia’s best students had to get the MCA president to appeal to the prime minister for a favour. All students with excellent academic results, regardless of race, are courted with open arms by the Singapore government. If we look at the problem realistically, it is so foolish to let Singapore take all our best students who will eventually graduate and work diligently for Singapore. It is also essential to practise meritocracy in the selection of employees. The most qualified must be given employment; in promotion exercises, the best and most efficient employees must enjoy recognition so that everyone will try their best to get promoted. Otherwise management will lose its respectability and the whole workforce will not work efficiently. There has been no Malaysian of ethnic Chinese or Indian origin appointed as CEO of any of our government-linked companies (GLCs) and government departments. I see this so often that I am no longer shocked. Perhaps that is why almost all the GLCs, such as Malaysia Airlines (MAS) and Proton are under performing. Singapore aspires to achieve pure meritocracy, with its emphasis on identifying and grooming bright young citizens for positions of leadership. There is also a strong emphasis on academic credentials; these are seen as objective measures of both intelligence and effort. Meritocracy is a central political concept in Singapore, and this goes to the heart of its founding myth. Specifically, Singapore is seen to have been “expelled” from Malaysia in 1965 as a result of the unwillingness of its majority ethnic Chinese to accept the special position of the Malays. The Federal Malaysian government had argued for a system which would give special privileges to the Malays as part of their birthright as an indigenous people. The Singapore government argued for the equality of all citizens of Malaysia, with places in universities, government contracts, political appointments, etc, going to the most deserving candidate, rather than to one chosen on the basis of connections or ethnic background. In the ensuing conflict, Singapore was expelled, and became an independent city-state. The TI table proves that practising meritocracy will yield much better results. 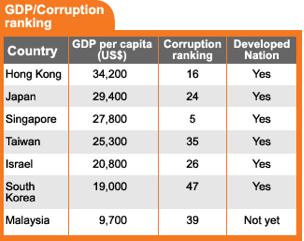 Considering that both nations started at the same level, Singapore’s GDP per capita is about three times bigger than Malaysia’s; its corruption ranking is among the best in the world. To avoid corruption, Singapore never gives out large contracts without calling an open tender. It is time for Malaysia to emulate Singapore’s system of practising meritocracy. All developed nations practise democracy and meritocracy. Their constitutions decree that all men are created equal and that life, liberty, and the pursuit of happiness are not to be infringed upon. All citizens irrespective of race or religion can expect justice, equity and equal opportunity. As a result, their citizens enjoy a higher standard of living than Malaysians. If Malaysia wants to be a developed nation, the government must accord justice, equity and equal opportunity to all Malaysians as Hanif preached on the first day of 2006.